1. Screen size: the iPad mini is rumored to have a 7.85 inch screen, compared to the 9.7 inch (diagonal) screen that the current iPads have. There are rumors out of Taiwan that Apple has already ordered 7.85 inch test screens from LG display and AU optronics. This is despite Steve Jobs’ outspoken opposition to smaller tablets. 2. 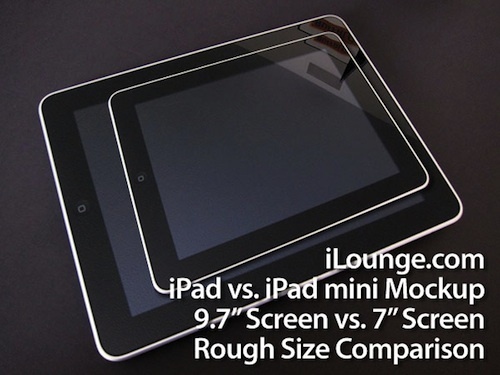 Resolution: the new screen is rumored to have the same 1024 x 768 resolution as the current iPad 2 screen. Hopefully this means that apps will run just as well on the mini iPad as on the current iPads. 3. Launch: it is rumored that the launch would happen early in 2012. 4. Price: most experts agree that any iPad mini would have to cost something close to $199 in order to be competitive with the new Kindle Fire. There are even rumors that the iPad mini will be cheaper but not smaller. Launch of the iPad mini is rumored to be followed closely by the launch of the larger iPad 3, which will have a 2048 x 1536 pixels high definition screen, as I related in my earlier post. My take on this is that the iPad mini might be great for children, with their smaller fingers. As a parent, I know I would be much more likely to buy my child an iPad mini of his own at $199 than a $499 or more iPad 2. I think the iPad mini is also great for people who primarily want to read or to watch movies on the iPad, and who therefore prefer something lighter and easier to hold than a full-size iPad. Would you consider buying an iPad mini? Please comment below. As the proud owner of a first-generation iPad, I am really looking forward to what Apple has in store for us with the iPad 3 when it hits stores possibly as early as October or sometime early next year. Here are some rumors that have been floating around the web. 1. Retina display. A very exciting rumor is that the new iPad 3 will have a retina display screen like that of the iPhone 4. A retina display has twice the resolution of an iPad or iPad 2 screen. This rumor originated with the discovery that some iPad apps included images that were sized to work with a 1536 x 2048 retina display. 2. 3D display. Even more exciting is the rumor that the next iPad will allow users to watch videos in 3D. Evidence for this includes the filing by Apple of several patents for a 3D display. With the advent of the Nintendo 3DS, an iPad with a 3D display seems very likely, if not now, then soon. 3. Flash camera. Another rumor is that the iPad 3 will have a flash camera much like that of the iPhone 4. Even less need to carry around a separate camera! 4. Lower price. The iPad now has more competition than when it first launched. Consumers have other tablet options, such as the Samsung Galaxy Tab and the new HP TouchPad. 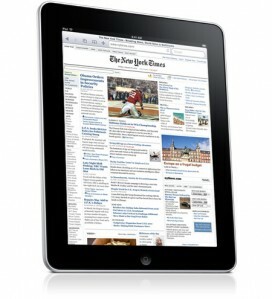 There is therefore a rumor that Apple will lower iPad prices when the iPad 3 launches. Whether any of these rumors turn out to be true or not, one thing is sure…I will probably be first in line to get the iPad 3 when it comes out!